Since qualifying as a herbalist and iridologist in the Master Herbalist tradition in 1997, Julia has been in full-time practice. Alongside the use of herbal medicines, Julia advocates cleansing, detoxification and healing diets as the foundation for good health. She has explored both Western and Eastern herbal traditions. Julia continues to expand her knowledge attending regular Continuing Professional Development courses to keep abreast of developments in herbal medicine. Her massage training, spanning two decades, has included Holistic Massage, Remedial and Deep Tissue Massage, Lymphatic Drainage Massage, Pregnancy Massage and other many advanced courses. Her reflexology training has included advanced courses focusing on treating in pregnancy and labour, hand reflexology and spinal reflexology. Julia believes in empowering people to make educated choices about their healthcare. As well as being a practitioner, Julia is an enthusiastic teacher, passing on her practical knowledge of herbs and natural health through short courses and workshops on topics such as herbal first aid and making herbal Christmas gifts. She has also taught a wide range of massage workshops. 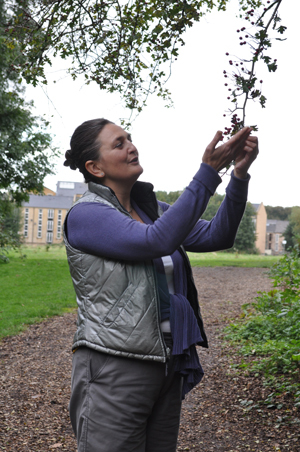 She has over 12 years experience of leading regular herbal and wild food walks, and has taught courses on wild food foraging to the general public, teachers and outdoor leaders. * The Association of Master Herbalists (and served as a council member for 6 years). * The International Federation of Reflexologists. Julia practises within the strict codes of professional conduct of each professional body.